Never was a boat delivery more popular than the Wednesday before this year’s Rolex Big Boat Series, hosted, as always, by the St. Francis Yacht Club. With the climax of the AC34 in progress, Fleet One boats gathered along the City Front to watch the foilers and get pumped-up for their own 4-day regatta and wrap-up of the 2013 championship season. 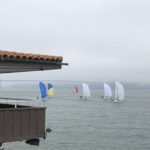 Unusually for San Francisco Bay and for the BBS, day 1 started with a postponement as competitors waited for breeze to build. The J105s bobbed around on the Circle Course for an hour or so, before racing commenced. Scooter Simmons’ Blackhawk dominated the day with a bullet and a second, finishing 4 points clear of Risk and 6 ahead of Arbitrage. Friday’s conditions were a replay of the first day with light and variable breeze in the first race, and good pressure in the second. Godot made the best of it and moved into first place overall with two seconds as Blackhawk suffered a 13th. A weather three-pete on Saturday returned the leader board to Thursday’s status quo after Godot posted a 15th and a 10th. The BBS format is for three days of windward-leeward racing, and an eagerly anticipated Bay Tour on the Sunday to round out the regatta. Once again a weather-hold delayed the start while breeze built for the J105s, joined by the J120’s, Express 37s and Melges 24s at the Alcatraz starting area. Racing finally commenced around 12:30pm and the fleet headed West to the weather mark into 8 kts of breeze. Half way down the first downwind leg J105 racers started to notice the J120s getting bigger rather than smaller as the two fleets compressed into a wind hole at the leeward mark. A mess ensued as boats struggled to make any way against a 0.5kt current in very light breeze. Re-live the fun courtesy of Adam Spiegel on Jam Session here. Notwithstanding the randomness of the breeze, the top boats remained top and the event wrapped-up with Blackhawk still in first, Arbitrage in second, Risk third, Mojo in fourth and Godot in fifth. Full results here. Videos, including the always popular music montage here. 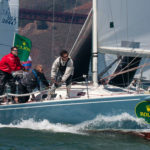 ..and so went the extremely challenging Summer Keel regatta managed by the San Francisco Yacht Club. It was obvious that the day was not going to be “normal” on the drive across the Golden Gate early on Saturday. The wind was already blowing, but from an unusual, Southerly, direction and the high clouds were drifting Northwest to Southeast – clearly something odd was going on. Jeff Zarwell set the course up to manage a breeze coming from about 200 degrees, with the pin slightly favored to discourage those “go right on the circle” boats from gelcoat-exchange and bad language close to the RC. The plan worked, helped, perhaps, by the allure of early ebb on the left. The fleet bisected and the two parts headed off in different directions – a pattern that repeated after each start and each leeward mark rounding throughout the regatta, with some skippers convinced that the right paid due to the curl effect around Angel Island, and others favoring stronger current, and unusual port tack “lull-lifts” on the South side. During the usual informal hand-waving debriefs at the excellent post-race party and BBQ, the fleet also split into two camps – the certain and the conflicted – with no apparent advantage to either attitude as far as picking the correct side or in the results of the racing. At the end of the day, Bruce Stone’s Arbitrage managed the unusual conditions best and won the regatta convincingly with three bullets, a second and a fifth, followed by Blackhawk and Mojo. Risk and Godot tied on points for forth/fifth overall, with Risk taking the tie breaker due to winning the first race. Don’t forget to sign up early for the Big Boat Series – September 18th is the deadline to avoid a whopping $250 late fee. On Saturday, the J/105 fleet was treated to its own race course on the Berkeley Circle courtesy of Sausalito YC, relocated from the area west of Alcatraz to the Circle to make space for the America’s Cup race course. Winds started at 12 kt and quickly grew into the high 20’s range on Saturday, with reports of gusts to 50kts after racing was over and folks were motoring home. Scooter Simmons’ Blackhawk dominated the first day of racing with a 4th and two bullets, while Bruce Stone and the team on Arbitrage were just three points behind with a 2, 4, 3. Mojo and Godot were tied for third a couple more points back. With such a closely bunched crowd, the regatta was anyone’s to win going into Sunday. Arbitrage was called over early in the first race, but clawed back for a hard-earned second, and then turned in another consistent race, finishing third, to nail the top spot on the podium despite no bullets. Mojo took second and Godot third. Past regatta winner Risk was just off the pace in this event but managed a bullet in the last race to secure 4th, while Blackhawk slid down to fifth place while sailing on Sunday with a borrowed boat after breaking their furler in Saturday’s heavy winds. Next race is the Swiftsure regatta out of the St Francis Yacht Club – register here. The carnage started early on a very blustery Berkeley Circle as Alchemy was forced to withdraw before racing started with a crew injury. 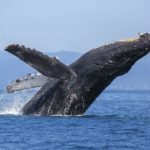 And matters spiraled from there, with a final tally of one dropped rig, a broken boom, broken rigging turnbuckles and countless round-ups, kite mishaps and saturated crewmembers. Of the 17 boats entered, only 7 made it though without at least one DNF, DNS or DNC. On the other hand, the big breeze made for some big grins and wild rides, with Godot clocked by Kattack at over 16 kts on one particularly gusty downwind leg. As racing wrapped up on Saturday afternoon, local monitoring stations reported sustained winds of 35kts and gusts over 40kts. Risk was the master of the big breeze, taking a 2,1,1 on Saturday and doing well enough on Sunday to win the regatta by a convincing margin. Godot was second overall and Arbitrage came in third. Links: Get results here. View the Kattack replays here. See Akula’s boom break here. A strong turn out of 18 J105s entered this weekend’s popular Aldo Alessio Regatta, sponsored by the St Francis Yacht Club. With good breeze, clear skies and moderate ebb, the City-Front buoy-race course favored right hand circles – out to the Central Bay for current help on the beats and tight along the beach for relief (or perhaps a little early flood) on the return leg. Arbitrage, Jam Session and Blackhawk appeared to be the boats to beat, with good finishes early on and close racing throughout the first day. Race 3 was particularly close as Blackhawk, Godot and Arbitrage converged, vying for space at the first weather mark zone. Unfortunately, Godot and Blackhawk converged rather more completely than either skipper was hoping for, resulting in the retirement of both boats. After the dust cleared on Saturday evening, Jam Session was in the lead followed by Arbitrage, Risk, Donkey-Jack and Blackhawk, granted 4.5 pts in lieu of their DNF. The RC arranged for longer courses on the second day of the regatta, placing the start line off TI and the weather mark just East of Anita Rock. This opened up wider lanes both upwind and down and changed the game from management of boat-on-boat tactics and micro-currents to raw speed. By the end of the penultimate race, any of the top 4 or 5 boats had a viable shot at taking the event. The regatta finished as Bruce Stone’s Arbitrage pulled out a bullet, which was enough to take the regatta from a well-sailed Jam Session, the Blackhawk team sailing Godot’s hull, Risk and Donkey-Jack. 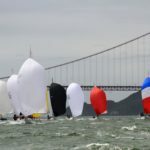 Challenging conditions greeted the 7 J105s that lined up with 200 assorted PHRF and OD boats for the Great Vallejo Race. A solid 17kts of breeze on the nose at the start in Berkeley Circle was followed by a light patch in moderate ebb under the Richmond Bridge and fine downwind cruising under blue skies with puffs to 21kts across San Pablo Bay. After rounding the first weather mark, most boats headed North East towards the Richmond shore and ebb-relief for the crossing under the bridge. When the wind to the East of the channel died, Akula and Blackhawk both spotted pressure to the West of Redrock and invested in cutting across the flow. This turned out to be the critical move of the race and ultimately resulted in Blackhawk entering the Mare Island Channel about 10 boatlengths ahead of Akula for the J105 class win – and 2nd & 3rd overall monohulls respectively on corrected time. Yellowfin followed in third place some 15 minutes behind. The race back on Saturday morning featured solid 15kts of breeze under a light overcast and strong ebb. Blackhawk legged out to an early lead in the channel, vanished over the horizon and finished in first place. Nirvana and Akula crossed tacks multiple times across the length of San Pablo Bay, with Akula’s slight upwind speed advantage finally overcoming Nirvana’s tenacious defense, resulting in another 2nd place for Akula and a 3rd for the Nirvana team. The J-Fest Regatta is always one of the highlights of J105 Fleet One’s championship season. Not only does the St Francis Yacht Club provide excellent race management, but the party, hosted by Norman Davant from Sail California, has developed a powerful reputation for good times, great live music and sponsored libations (Mount Gay Rum and Mount Beautiful Winery). Norman presides as ring-master for a highly entertaining and boistrous raffle, sponsored this year by Svendsens, Trident Funding, West Marine, Cameron International, Doyle, Hall Spars, Seashine, B&G, North, JBoats, Quantum, and Interlux. The J105s fielded an impressve 20 boat fleet for 5 races over 2 days in the usual windward-leeward format. Conditions were clear and sunny with 12 to 18 kts of cool breeze from a slightly more Southerly direction than is typical for the City Front course. With a well established and strong ebb running both days, the obvious imperative after each start was to find a clear port tack lane back out to the stronger current and breeze in the Central Bay. Starting well was particularly critical to snagging a premium lane, with the tactical benefit at the boat end offset by a slight bias in favor of the pin. Downwind legs also presented choices, with some boats preferring the northerly, more direct VMG course in breeze, but adverse current, while others chose a fast mode to the beach and ebb relief. Mojo took the first race, and the subsequent bullets went to Godot and the Arbitrage team sailing the borrowed Joyride hull while their boat awaits repairs. Donkey and Risk also showed good results and Blackhawk returned to form with a bullet in Race 4. As racing ended it looked like Mojo’s regatta with Godot also placing well, however, a start line altercation between the two boats in race 4 spawned a protest. When the dust cleared late on Sunday evening, the jury handed down a mutual-fratricide-by-protest ruling and both were DSQ’ed – Godot for rule 11 and Mojo for rule 14. Donkey Jack’s bullet in the final race allowed them to inherit an impressive debut victory for their new stick. Team Donkey was followed in the winner’s circle by a very consistent Risk, the well-sailed Advantage3, Blackhawk and excellent performance by Alchemy, taking 5th overall. Kattack replays are available here. Don’t forget to sign up for Vallejo on May 4 & 5 and for the upcoming Aldo Alessio Regatta (J105’s skip Friday’s distance race and participate in buoy races on Saturday and Sunday). March 16/17th weekend heralded the beginning of the 2013 J105 A-Series Championship Season as the St Francis Yacht Club hosted their annual Spring One Design regatta. A large fleet of 22 boats lined up for the first start under clear skies, changing ebb-flood and wind that appeared to be highly conflicted. Halfway through race 1, the 7 kt breeze swung around 180 degrees and shut down, leaving competitors drifting with kites up and mill-pond conditions, forcing the RC to abandon and postpone racing for an hour. The wind finally came in from more or less the usual direction and with more or less the usual vigor at about 1:30, and the fleet restarted. Donkey Jack took the first race and followed-up with a third in race two as Risk showed their class with a bullet to add to their 4th in race 1. The RC elected to squeeze in the promised third race into the building flood and 18kt South-Westerly, setting the fleet off with a pinch-fest to the beach and tacking scrum as boats fought for space, breeze and current relief along the shoreline. Donkey Jack rounded the weather mark with a good lead and inexplicably broke their mast in two places. No-one was hurt and racing continued as Donkey-Jack cleaned up and headed into the YC to assess the damage. Day two began with similarly variable wind; racing started late as the breeze stabilized and built up to 8 to 9 kts from the South West. In race 4, Risk took first place ahead of Team Donkey Jack, sailing the borrowed JoyRide hull with Donkey sails. The regatta wrapped up with the returning Nantuket Sleighride taking the bullet from Risk with an impressive 2nd place. Donkey-Joy finished just off the podium in 6th, a highly respectable result considering the DNF in race 3. Adam Spiegel’s Jam Session leveraged light-air speed and consistency, gaining a convincing overall win in the RegattaPro Winter One Design series that wrapped up on Saturday Feb 9th. The four day series spread over the winter months is an annual off-season favorite of Fleet One J105s, this year attracting 17 entries for light air and highly tactical racing on Berkeley Circle. Jam Session totaled just 15 points over 6 races, 16 points ahead of Alchemy on 31. Akula and Donkey Jack tied on 33 points, the third place going to Akula on a tiebreaker. A full list of results is available here. Kattack re-runs for participating boats can be found here. Chris Perkins led his Masquerade team to victory at the J/105 North American Championship. Hosted by the San Diego Yacht Club, the San Francisco-based boat led from race 1 through race 9 with a remarkably consistent line of 1,2,2,1,3,2,4,4,4 for 23 total points. The team consisted of Perkins, Steve Marsh, Tom Purdy, Mark Chandler, Larry Swift and Rose Eberhard. Former J105 NA champion and Fleet One stalwart Bruce Stone took 5th in Arbitrage. 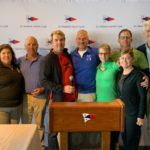 And in another strong showing for Fleet One in warm-weather away regattas, Scooter Simmons took second overall in the BVI NOOD Regatta Championship. Congratulations to Chris, Bruce and Scooter for strong Fleet One representation in highly competitive national/international level events.